Winter in historical Alaska often conjures up images of rugged, stoic people struggling through a time of meager resources and brutal cold and darkness. Winter for many of today’s Alaskans, however, is a time to enjoy hockey, skating, and downhill and cross-country skiing. Probably the earliest skiing in Alaska took place on the Seward Peninsula in the first years of the 20th century. However, it was not until the 1930s that skiing became popular elsewhere in the territory. Group of cross-country skiers, circa 1930. UAF-2006-103-2, Crosson Family Papers, University of Alaska Fairbanks Archives. 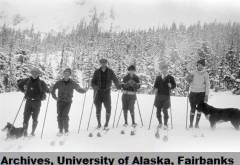 Fairbanks stepped to the front rank in the booming procession of ski enthusiasts yesterday when she turned out no fewer than 250 devotees of her popular mid-winter outdoor sport.In taking this step Fairbanks easily becomes the ski capital of Alaska. Numerous as are the number now equipped and ready to go, they are nowhere near the number who will be recruited for the sport locally, and in other Alaskan communities and throughout the continent. America has discovered, after many years, that the great Scandanavian sport is admirably adapted to conditions in the greater part of the nation in the winter months. The sport has trebled in popularity in the States within the last three years. It is converting drab months of the year to those of exhilirating and health-giving sport. Downhill ski race, date unknown. UAF-1958-1026-2368, University of Alaska, General File, Vertical File, University of Alaska Fairbanks Archives. The democracy of skiing is undisputed. Youngsters and oldsters find it alluring and within their financial and physical reach. Not all go in for the acrobatic and hazardous or more strenuous phases of the sport, but all find they can adapt themselves to some degree of the wide range of its activities. . . . It is roughly estimated that about $30 is invested in Fairbanks by every individual in purchase of a first class pair of skis, and the suitable skiing togs, including shoes, suits and the like. Allowing that there are 100 already fully equipped here, would mean an investment of $3,500 [sic]. If the 250 reputed ski enthusiasts in the community equip themselves at the estimated per capita cost it will mean an outlay of $7,500. And this is only a starter. In addition to costs of equipment are those of fitting up ski courses, huts and the like. They all cost considerable, but are worth it. The merchant may see in this new sport something very much worth encouragement and the participant in the sport gets his money’s worth many times over. . . .
McKinley Park with its Mt. McKinley and high and perpetual snowy slopes afford opportunities for visiting tourists and others to indulge in the sport of skiing the year round. Such parks and lofty peaks in the States draw their quota of ski enthusiasts constantly–and there is no reason why skiing should not be among the pre-eminent year-round attractions in such Alaskan resorts and a standing lure well worth advertising. 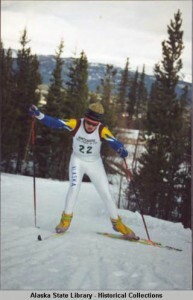 Alaskan cross country ski racer, April 1992, Arctic Winter Games, Whitehorse, Yukon Territory. ASL-P399-1008, Arctic Winter Games Team Alaska Collection, Alaska State Library-Historical Collections. With Fairbanks now so well launched on a ski career, her leading spirits can do much to keep her to the fore by giving her ski competitions a headline position in the winter programs and keeping her at the front of the parade as the winter sports capital of Alaska. 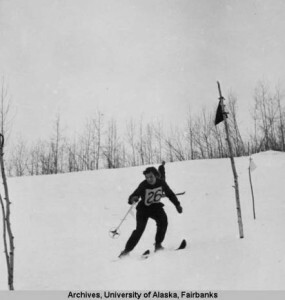 Leonhard Seppala, world-famed as a dog racer, has won another well merited laurel as organizer and first president of the Fairbanks Ski Club and he and others devoted to the cause deserve a big hand and unqualified support in their popular new movement. A good way to do this is to join the growing throng of those who trick themselves out in the gay togs of the skiier and swarm into the hills and share the thrills and the rich, red blood and better health that comes with the sport. Elizabeth Tower, Umbrella Guide to Skiing in Alaska, Downhill & Cross-Country (Epicenter Press, 1997). Information in the introduction to this webpage was derived from articles in the Fairbanks Daily News-Miner, February 1 and 12, 1937, and from Tower’s book.